Essay wins Department of Virginia! 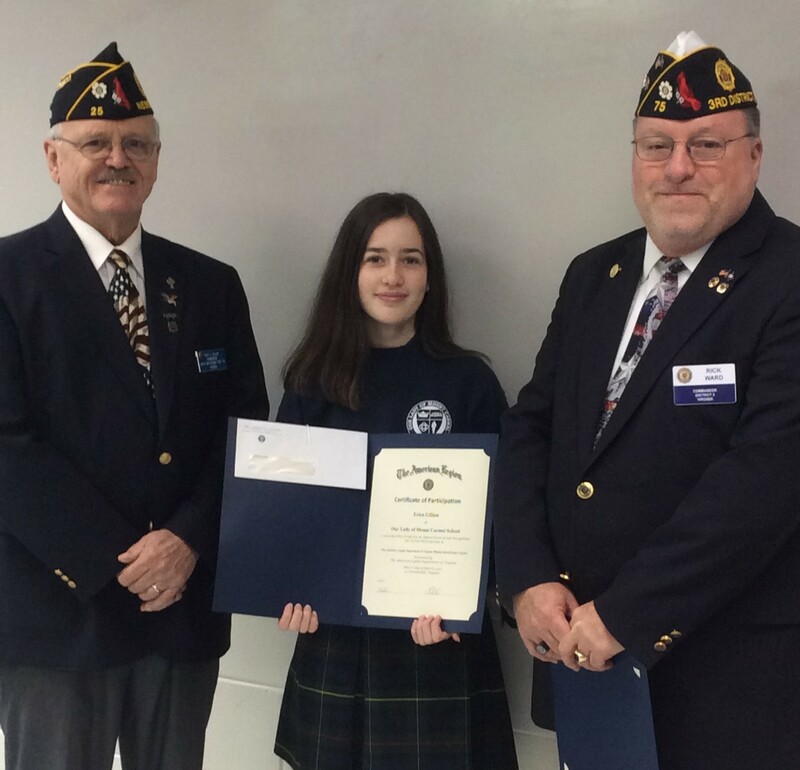 Mr. Sean Devlin from Post 25 and 3rd District Commander, Rich Ward from the American Legion returned to Our Lady of Mount Carmel to present OLMC 8th grader Erica Gillian with another award. After her essay won at both the post and the district, she advanced and went on to with the state competition, receiving $250 for the 1st place middle school essay for the Department of Virginia. Mrs. Jessica Peters, our Literature teacher, was also honored for her great work with our students. Congratulations! 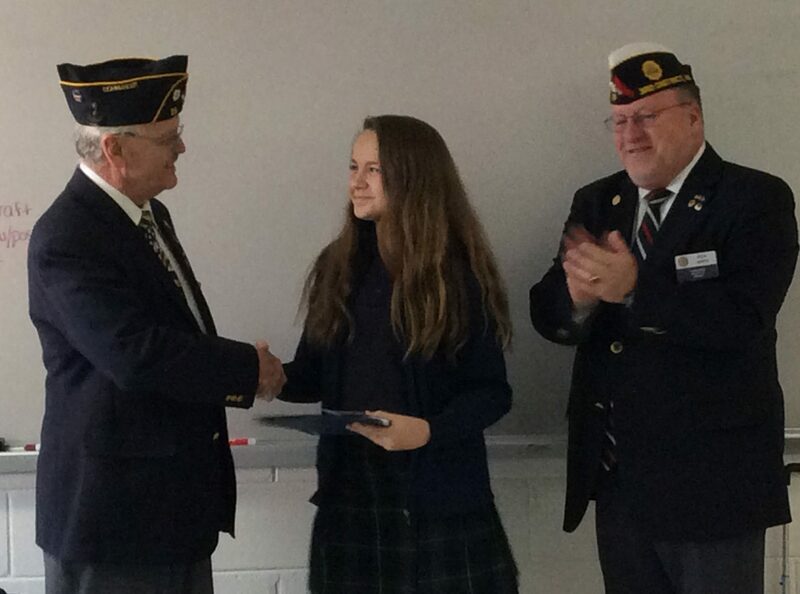 American Legion Middle School Essay Contest – OLMC Winners! Last fall, Mrs. Peters’ 8th grade students wrote essays as we prepared for our Military Appreciation Day. Today we were privileged to have two Commanders from the American Legion at OLMC to present awards. Our students did extraordinarily well, taking all three places at the post level: Erica won 1st, John placed 2nd, and Leila took 3rd for Post 25; Post Commander Sean Devlin presented these students with their award. Commander Devlin then submitted Erica’s essay to the District along with winners from 13 other Posts. The 3rd District Commander, Rich Ward presented Erica with the 1st place prize for the District. Erica’s essay now advances to the State competition on Friday. Congratulations to our 8th graders and to Mrs. Peters who helped them prepare their essays! 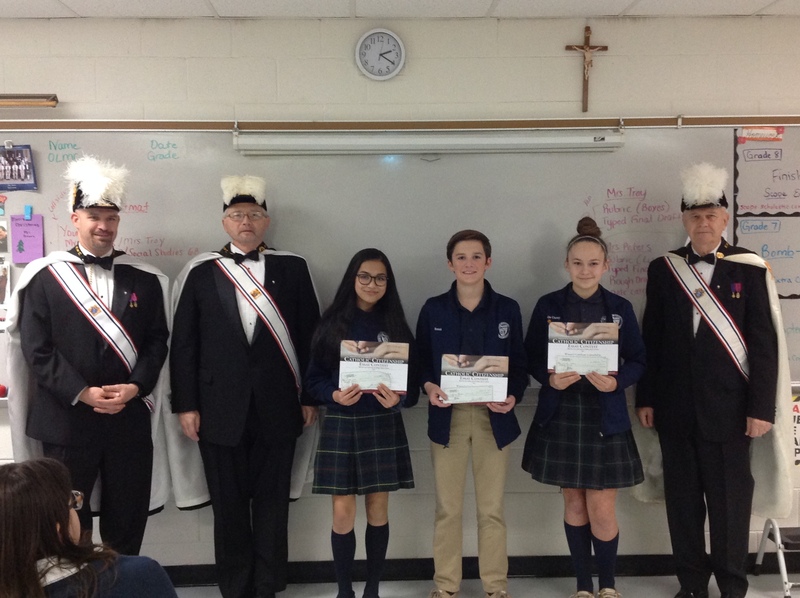 All of our eighth grade students recently had the opportunity to participate in the Knights of Columbus Catholic Citizenship Essay Contest. The topic for the essay was “How does your family keep its Catholic Faith in Action?” Our winning students were Nhi Nhi Do in first place, Leila Carey in second place, and Gabe Rossi in third place. Three Knights from Council #5480 came to present their awards. Congratulations, 8th Graders!!! 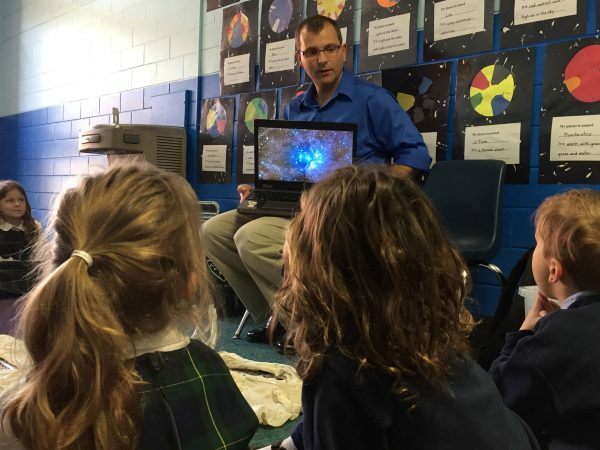 Kudos to our intrepid OLMC teachers, who recently engaged local NASA scientists to visit Kindergarten and middle school classes for hands-on scientific studies! The school’s proximity to the Langley Research Center, combined with our learning partnership with NASA educators, continues to reap wonderful academic opportunities for our students. On Jan. 26, our 24 kindergartners took a “trip into space” with NASA Scientist Dr. Tom Drozda, also known as “Dad” to 6th grader Bella Drozda and 4th grader Henry Drozda. In his work at NASA, Dr. Drozda studies ways to design hyper-sonic engines used on vehicles to access space. Despite his busy schedule, Dr. Drozda always makes the time to visit OLMC to talk about the importance of NASA’s projects. The kindergartners’ recent unit on space provided the perfect opportunity for teacher Annie Kocinski to invite to talk with our students. To the thrill of everyone, Dr. Drozda talked about NASA’s current exploration missions and enlisted the students’ participation in a balloon rocket demonstration and moon crater experiment. He also brought an artifact kit containing components of an astronaut’s spacesuit used for the moon landing missions. For their participation and attentiveness, each student received a thank you bag containing more information about NASA including a space-themed activity book. These reinforce key concepts that the kindergartners had learned about space exploration. Just three weeks later, four members of the NASA/Langley Research Center Science Education Team visited our middle school, as 20 OLMC students presented their team research projects about aerosols to this esteemed team of scientists. Under the mentorship of OLMC and NASA educator Angela Rizzi, along with Dr. Margaret Pippin, lead scientist for the GLOBE Air Quality Student Research Campaign, the students collected, analyzed and interpreted data on Aerosol Optical Thickness (AOT). Two teams investigated whether the amount of aerosols increases throughout the day; another team researched the influence that wind direction may have on levels of AOT; a fourth team compared AOT data collected by two other schools (in Dearborn, MI and Mendham, NJ) to their own AOT data to prove their hypothesis that AOT levels are higher in urban areas when compared to suburban or rural areas; and finally, another team presented their findings after collecting data at OLMC’s carpool area, where they expected to see increased AOT levels. Our middle school students not only presented their research results and posters but also answered questions from the panel about source origins and validity, as well as the importance of technological collaboration when working as a team. Our budding scientists are now preparing to submit their research reports to the GLOBE 2018 International Virtual Science Symposium. Thanks to creative thinking and collaboration on behalf of our teachers, OLMC students continue growing in their understanding of our world and the ways they can contribute and make a difference. 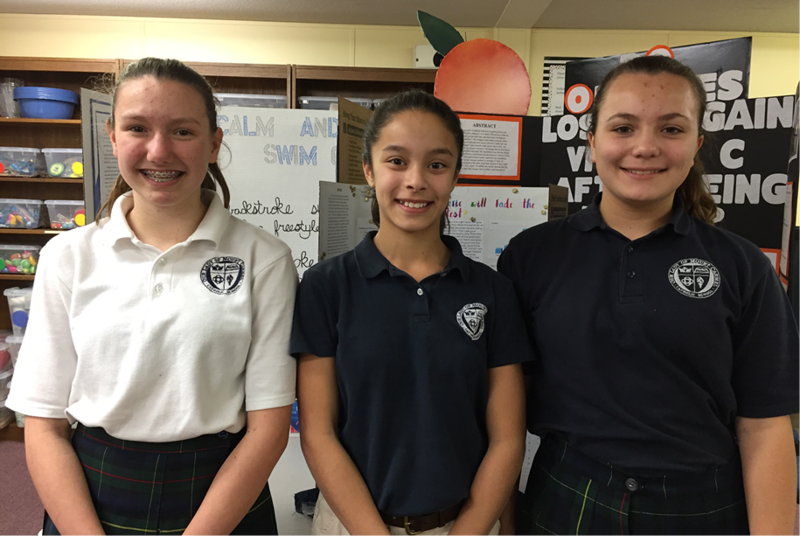 The Winter Olympics begin, our 8th grade students found a new way to participate: a classroom etiquette competition! As part of the 8th grade fall curriculum, Sr. Mara Rose coordinates a special unit on etiquette. Students watch videos, listen to lectures and practice to improve their manners. In light of the Olympic events, Sister created a fun Olympics-themed competition for the students to practice proper etiquette, including how to shake hands, engage in face-to-face conversation and enhance their listening skills. They competed with each other to improve these communication skills, with all eyes on the grand prize: winner would earn the privilege of redesigning the 8th grade lunchtime seating chart! The highlight of the class is the final unit: mastering a formal dinner. Sister and Mrs. McWhorter created the menu and with help from parents, prepared a homemade meal of creamy tomato soup, yeast rolls, chicken kiev, fancy macaroni and cheese, and roasted vegetable medley. The lunch also included a simple balsamic vinaigrette salad, plus homemade cream puffs and hot chocolate with homemade marshmallow cream. In addition, there was a homemade fruit tea drink. Faculty and staff attended the dinner with the students, scattered in seats as “heads of table” to help facilitate discussion and ensure the students practice their new skills. 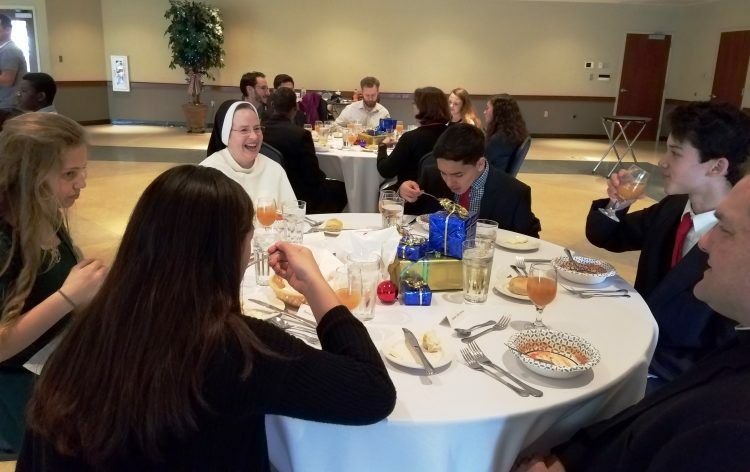 Sister received both glowing praise and amusing tales from the adults for her students’ skills and luncheon experiences, as a great time was had by all attendees. What do Jell-O, crabs, cookie sheets and driverless cars have in common? Our OLMC school students know the answer: these were just some of the topics they presented at the school’s annual science fair on Nov. 14. Now in its seventh year, this academic event is represented by students from all grade levels. The Pre-K through fourth grade students complete increasingly complex class projects, learning to make observations, ask questions and create hypotheses. Our eighth grade students take their entries beyond our school, creating data analysis projects for the GLOBE International Virtual Science Symposium in the spring of 2018.